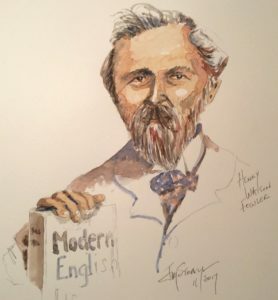 Henry Watson Fowler’s book, Modern English Usage, is as a good volume to have for those who are interested in English as you can get. One of my favorite topics is the English language — its history, development, and use. Over the decades, a number of great scholars have devoted their lives to studying the language, and they have shared their knowledge, understanding, and conclusions with the rest of us. One of those scholars was Henry Watson Fowler, an English schoolmaster who lived from 1858 to 1933 and made the study of English his lifelong work. Fowler’s classic is A Dictionary of Modern English Usage. It was originally published in 1926 and has since been revised and updated. It is so well known and established as essential among scholars that its title is now Fowler’s Dictionary of Modern English Usage. I bought a copy of this book early in my academic career of teaching about journalism and journalistic writing, and I have kept it ever since and referred to it often. Fowler is insightful and often wry, and the entries — long or short — are always fun to read. If you have one book on your shelf about the language, Fowler should be the one. Intended, n. It is curious that betrothed people should find it so difficult to hit upon a comfortable word to describe each other by. ‘My intended’, ‘my fiance(e)’ , ‘my sweetheart’, ‘my love(r)’, ‘my (wo)man’, ‘my boy (girl) friend’, ‘my future wife (husband)’, ‘my wife (husband) to be’ — none of these is much to their taste, too emotional, or too French, or too vulgar, or too evasive. The last two objections are in fact one; evasion of plain words is vulgarity; and “my intended” gives the impression that the poor things are shy of specifying the bond between them; so too with ‘my engaged,’ and the modern word ‘steady’ does not necessarily imply serious intentions. And so in finance(e), they resort to French instead of vague English for their embarrassing though futile disguise. It is no doubt too late to suggest that another chance be given to betrothed. It means just what it should, i.e., pledged to be married, and is not vulgarized and would be a dignified word for public use. But it is so out of fashion as to sound facetious. Fowler’s book is full of this kind of stuff. Get one for yourself or for someone who loves the language.